A delicious, creative way to use up leftover pumpkin pie is to make homemade pumpkin ravioli. I love it with a brown butter sauce and sage. Easy to do and take help from Wonton wrappers in place home homemade pasta sheets. If you are a fan of pumpkin you are going to want to try my recipes for Pumpkin Coffee Gelato, Easy Pumpkin Hummus and Sriracha Roasted Pumpkin Seeds. Pumpkin ravioli is great to go along your juicy roasted Thanksgiving turkey or you might want to try a sous vide turkey breast this year! And don’t forget to use any leftover turkey to make my amazing Thanksgiving poutine. This recipe was featured in BuzzFeed. In my house the one pie that everyone brings and no one eats is pumpkin pie. I don’t have anything against pumpkin pie. Truly, I don’t. 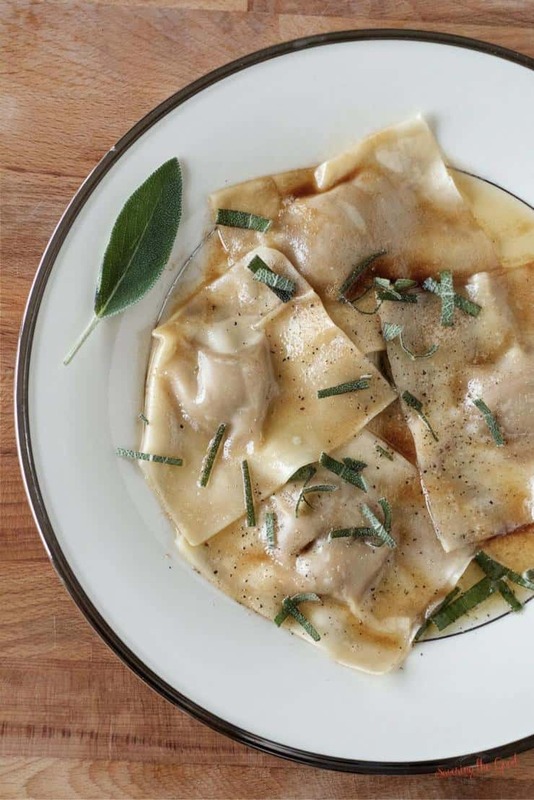 But what I love is using the leftover pumpkin pie in this delicious pumpkin ravioli recipe. Plus if you pour brown butter and sage on any pasta, you are going to be fighting me for seconds. Instead of making fresh pasta (although you are welcome to) I take a little help from store bought wonton wrappers to make pumpkin raviolis. Slice wonton wrappers in half, length wise. Spoon out the filling of the leftover pumpkin pie. I use about a tablespoon per ravioli. Place the pumpkin pie filling centered on the upper half of the wonton wrapper. To seal the ravioli, run a small boarder of water around the edge of the ravioli. 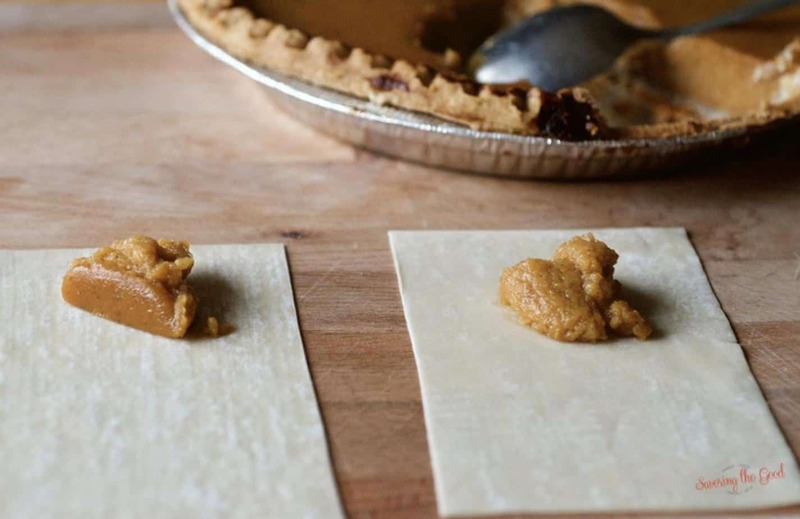 Fold the wonton wrapper over the pumpkin pie filling. Be sure to remove all the air, or as much as possible, from around the filling as you seal the raviolis. If you have a large air pocket you have a higher chance of the ravioli busting open as they cook. How to cook pumpkin ravioli. Look how nice and neat they are.If you want to get extra fancy you can use a circle cutter to trim away the corners of the square ravioli. It is not necessary, but it will give you one more layer of fancy if you do. Drop them into a pot of boiling water for 2 minutes. While you are waiting for the water to come to a boil, start your brown butter sauce. In a saute pan, heat 4 tablespoons of butter on medium heat and allow to the milk solids in the butter to toast. You have now made a brown butter sauce. It is that easy! If you would like to add one more layer of flavor to your sauce, add a few leaves of fresh, sliced sage leaves. Garnish with sliced, fresh sage. This post originally published Nov 10, 2016.